This, my friends, is my kitchen. And although just one photo, there is not much else in it. And it works and I am thankful. But, one day it will happen and the husband will say, "Honey Lamb, it's time to do the kitchen". Okay- so maybe he won't say honey-lamb, but that's not the point! And when he says its time, I'll be ready! I want blackboards- and this I can do myself. I want a black splash of blackboards that I can write whatever I want on. 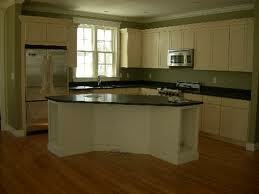 I love this one with the cabinets painted. I can even write the menu for the week. I want vinyl labels on clear containers. And I want a large thin container for straws- the husband has been using them lately and they come in so many nice colors. Or maybe I would get these labels that I can write on them in chalk! 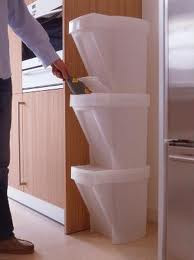 I want a cool recycling bin to separate all the recyclables and the kids won't bother me about saving the earth. Treehuggers! I saw a movie when I was young and their kitchen was black and white tiles- this screams kitchen to me and I love it. And I love the idea of an island and the kids eating cereal on it or telling me about their day. And on that old show, "Everybody Loves Raymond", they had corner glass kitchen cabinets- I love these and know I would have to keep them tidy because people could see in, but I love them. And my last item is something I find out of character for myself. 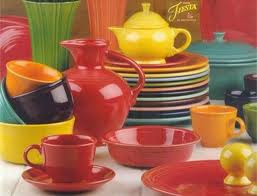 But I have been in love with fiestaware since we registered for our wedding at JcPenney over 12 years ago. I didn't register for it and of course, went for something practical. But the love for the fiestaware is still there. 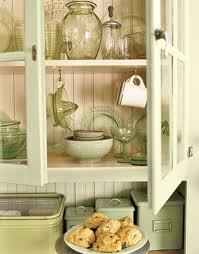 I want every color and want to mix and match and let the color shine through the glass cabinets. What's your favorite thing in your kitchen or what would you love to have? The chalk board cabinets were cool. You can do it yourself! We did ours ourselves and it turned out great. We even painted our countertops. Blackboards would be SO fun! What a great Inspiration! i love all the inspiring ideas here - especially the chalkboard painted cabinets! we have guests all the time so it would be nice to never have to say "the glasses are in the cabinet to the left of the sink!" lol! have a great day! Love the blackboard idea and the colorful dishes! I love the idea of chalkboards! I also would love to have a large one for meal planning. I also love the term "honey lamb" :) Hope you hear it soon & get your dream kitchen! I love the second picture, along with an island. Our kitchen is small but it has a nice bay window which makes it nice to me! If I ever move into a house with a large kitchen I would love a breakfast type counter with stools where the kids could sit while I cooked :) I love the glass cabinets too, but what a job to keep clean (inside and out)! I looove fiestaware, it's one of my favorite wedding items! WOW.... Dream BIG!! I love fiestaware. I have a lot of it & the vintage pieces too that came from my Mom!! Don't ya' just love the color?? 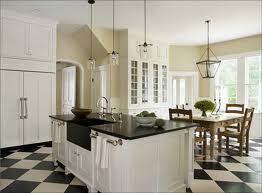 Love the black and white tile floor, especially laid out like that.. I'm seeing a black and white theme in your future! I love those chalkboard stickers. Great pics/ideas! I have colorful dishes form WalMart (red, green, blue, yellow) and love them...and they're cheap! 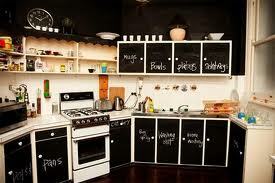 And I would SO love chalkboard cabinets...never seen any! ...I'm wondering (from your comment this AM)...are you going to be a 'newbie' this coming school year?!?!! I love it! Really love the chalkboard wall! Maybe he WILL say "honey-lamb"! hahaha I love the black boards! i hope your dream comes true for you. i am scared of the glass front cabinets...i would have to get fancy dishes for them haha. Hey! Thanks for dropping by- I love comments and read them all! New Set-up and Giveaways I've won!